Air101: Teenager couldn't wait to get to the gate! Teenager couldn't wait to get to the gate! A male teenage passenger on a Copa Airlines flight that had just landed at San Francisco International Airport Tuesday just couldn't wait to get to the gate. He opened the emergency exit, and climbed out onto the wing and jumped down to sprint across the tarmac apron. 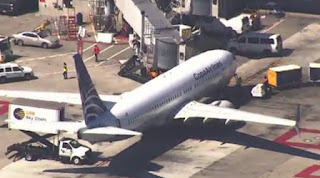 A spokesperson for the airport, Doug Yakel confirmed that at around 2.30 p.m on Tuesday 1st August, a 17-year-old male on Copa Airlines flight 208 inbound from Panama City that had landed at the airport left the aircraft through the overwing emergency exit door, jumping down to the tarmac. The teenager was stopped and detained by a member of a construction crew on the apron and was later taken into police custody. The aircraft then continued to taxi to its gate and all the other passengers disembarked as normal. Copa Airlines issued the following statement. Witnesses said the teen seemed 'fidgety' and 'anxious' throughout the seven-hour flight. He allegedly was already on the ground and running by the time many passengers realized the door had been opened. After being taken into police custody the teen was later taken for a medical evaluation.